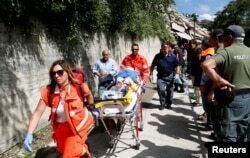 Italian officials have raised the death toll from Wednesday's earthquake to at least 247 people and injured more than 360. Rescuers are continuing to search for victims buried in the debris. Earlier Wednesday, Prime Minister Matteo Renzi traveled by helicopter to the affected areas and shook hands with the rescue volunteers. Renzi also spoke with the minister of infrastructure and the head of the civil protection agency. The earthquake struck the region just after 3:30 a.m. local time Wednesday, causing extensive damage to three cities near the epicenter. Children were among the dead. The U.S. Geological Survey put the epicenter of the magnitude-6.2 quake about 10 kilometers southeast of the town of Norcia. The shaking was also felt across a large part of the Umbria region, including the capital, Rome, 150 kilometers away. The hardest-hit areas included the towns of Amatrice and Accumoli, which was largely reduced to rubble. "Three-quarters of the town is not there anymore,'' Amatrice Mayor Sergio Pirozzi told state-run broadcaster RAI. "The aim now is to save as many lives as possible. There are voices under the rubble; we have to save the people there." The civil protection agency confirmed that at least 53 of the dead were in Amatrice alone. "The whole ceiling fell but did not hit me," Amatrice resident Maria Gianni said. "I just managed to put a pillow on my head and I wasn't hit luckily, just slightly injured my leg." Another woman, sitting in front of her destroyed home, said she did not know what might have happened to her loved ones. "It was one of the most beautiful towns of Italy and now there's nothing left,'' she said. The Rev. Savino D'Amelio, a parish priest in Amatrice, called the situation an "immense tragedy." In the neighboring province of Marche, the earthquake was felt at 3.36 a.m. In Montefiore dell'Aso, about 90 minutes away by car from Norcia, the epicenter, the shock lasted about 30 seconds, VOA's Jamie Dettmer said. Rescuers work on a collapsed building following an earthquake in Amatrice, central Italy, Aug. 24, 2016. Dettmer said residents at the Hotel Magnolia, perched above a picturesque valley running into the Adriatic, were shocked by the quake's strength and duration as they evacuated the building, fearing aftershocks. "The hotel creaked and groaned ... as the prolonged jolt tested the building, which held up well. There was only a slight and small superficial crack in the masonry," he said. Outside the hotel, guests trawled the internet for news and called family and friends to find out if they were all safe. About 45 minutes later, a second, weaker temblor lasted about 20 seconds. And later on, another aftershock was felt, also lasting about 20 seconds. A woman, second left, cries after she was rescued from her home following a quake in Amatrice, central Italy, Aug. 24, 2016. 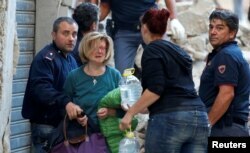 Dettmer said more than 80 aftershocks have been felt since the initial large tremor in different parts of Italy. "Italians in the central provinces of Lazio, Marche and Umbria are on edge," he said. "Many people are fearful of a repeat of the devastation caused in the 2009 earthquake that wrecked the city of L'Aquila, in which 309 people died. So far it is smaller villages that have been mostly affected." Wednesday's quake was not far from L'Aquila. Most of the dead were in the villages of Accumoli and Amatrice. Another village to the southeast of Norcia, Pescara del Tronto, was leveled. Several days earlier, central Italy had experienced slight tremors. 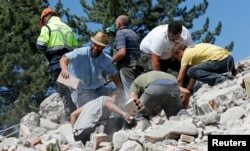 Rescuers search amid rubble following an earthquake in Amatrice, Italy, Aug. 24, 2016. At the Vatican, Pope Francis expressed his sorrow for the people and cities affected and canceled part of his general audience to pray for the victims. German leaders have offered condolences and assistance to Italy. France is also offering Italy all the help "that might be necessary" after the deadly earthquake in Umbria. Christos Stylianides, the European Union's crisis management commissioner, said the EU emergency response center is in contact with Italian civil protection authorities to see what additional help might be required. Italy's civil protection agency said several hundred people were injured and many others are in need of temporary housing. An injured person is carried away on a stretcher following an earthquake at Pescara del Tronto, central Italy, Aug. 24, 2016. "Quakes of this magnitude at this depth in our territory in general create building collapses, which can result in deaths," said the agency's head, Fabrizio Curcio. Rescuers worked after daybreak to try to reach those trapped in the rubble of collapsed buildings. "We are only hoping there will be the least number of victims possible and that we all have the courage to move on," D'Amelio said. July 2001 – 5.2 quake shakes the northern Italy's Alto Adige, killing one woman. October 2002 – 5.9 quake in Campobasso, kills 30 people, most of them children. April 2009 – Powerful quake in Abruzzo kills more than 300 people. 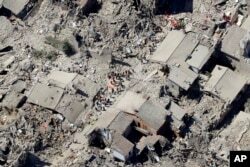 May 2012 – 16 people killed and 350 injured in earthquake around Modena.